After you’ve been hurt on the job in Ohio, you may have assumed that, since you were injured doing work for your employer, you would be able to collect workers’ compensation benefits quickly after your accident. Unfortunately, this isn’t always the case. Many workers don’t realize that their applications are incomplete when they file for benefits. Additionally, some employers and insurers find flimsy or even untrue reasons to deny claims. A denial of your claim doesn’t always mean you aren’t entitled to benefits. It does mean that you’ll have to appeal your denial, and that you may be in for a longer fight than you had originally anticipated. 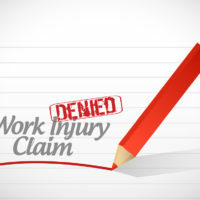 Read on to learn more about some of the common reasons for workers’ compensation benefit denials, and speak with an experienced Ohio workers’ compensation lawyer for help in appealing your claim’s denial. Often, an insurer or employer will assert that your injury was either completely or partially pre-existing, and that they shouldn’t be forced to pay all or even a portion of the cost of your treatment since the injury wasn’t received on the job. This argument can be disproven with use of medical records from before the accident showing a clean bill of health from your doctor. You might also use other evidence of being in good physical health prior to the accident, such as testimony from those with whom you played rec league sports prior to the accident at work. Submitting a claim for benefits to the Ohio Bureau of Workers’ Compensation (BWC) requires that you complete all forms by the required deadlines and provide extensive documentation of your injury. Gathering the necessary documentation from all medical providers or ensuring that physicians have submitted these documents on your behalf isn’t always easy. A workers’ compensation attorney can help ensure that your application for benefits is complete, or help you submit a revised application. In Ohio, workers have two years to file a claim for benefits after they’re hurt on the job. That said, waiting too long to report an injury to your employer or to the BWC could weaken your claim. By delaying your claim, claim evaluators may become less likely to believe the injuries were received on the job. Additionally, witnesses may forget what happened when you were injured on the job, further diminishing the strength of your claim. You will need to meet an even higher standard to prove that the injury happened as you claim it did. After you’re hurt on the job, speak with an experienced Ohio workers’ compensation lawyer as soon as possible by contacting the Columbus workers’ compensation lawyers at Miller Law Practice, LLC for a free consultation, at 614-591-6822.